Traveling with your man can teach you a lot about your relationship. Visit this beach resort and see how well you get along on vacay. It's Tuesday, and there's nothing else you'd want more than to hie off to some seaside resort with your man. So, as early as now, plan your holiday couple trip before hotel rates and airfare jack up. Will this be the first time you're traveling with your man? Take this opportunity to test how well you really know each other. Holing up in a relaxing beach resort is a great way to strengthen your bond. 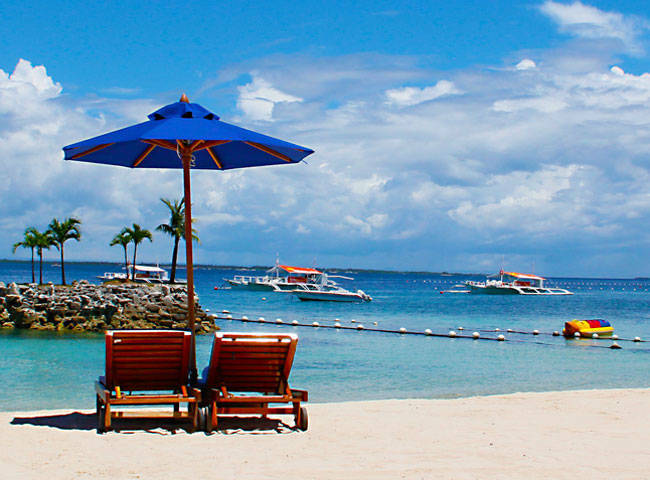 Our newest destination reco is Movenpick Resort in Cebu, which is only 15 minutes away from the Mactan airport. It is the first Philippine branch of an international upscale hotel management company from Switzerland. Unwind with your beau in one of the deluxe rooms or spa suites, and opt for a balcony so you can enjoy the majestic view of the Hilutungan Channel and nearby islands. We recommend the suite with a king-size bed because it also comes with a living room area that has fantastic views of the azure sea. On your first night, check out the romantic ambiance of Manny O’s Wine & Tapas. The restaurant is located at the end of a wharf and offers sweeping views of the sea. Toast to your relationship with their award-winning wines that go well with the delectable fusion of Asian and European dishes. After your meal, visit the resort's spa and wellness center and book their couple's room called Bliss, which comes with its own outdoor rain shower, jacuzzi tub, and verandah with a cool view of the beach. Choose from any of the Fire, Water, Air, or Earth spa rituals, which include facials, body massages, body wraps, and herbal baths. Enjoy the best this resort has to offer from the moment you arrive 'til late at night, then wake up to a glorious morning that's perfect for hitting the beach and having great conversations as you tan side-by-side.